Penybont, Crossgates and Llandegley are small villages in the heart of rural Mid-Wales. The villages are in the ancient parishes of Llanbadarn Fawr and Llandegley and adjoin the parish of Cefnllys. The river Ithon, a tributary of the Wye, runs through the area. The main industry is agriculture. There is an area school at Crossgates and a station on the Central Wales Line at Penybont. There is the site of a Norman castle at Cefnllys and a deserted village around the church. 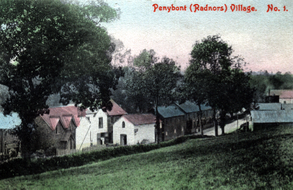 The shop at Penybont dates from the early eighteenth century.